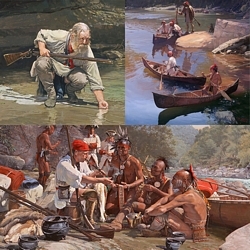 Image Size: 25"w x 24"h.
Natural rock shelters, caves or overhangs, were utilized by Native Americans as well as their nemesis, the European Longhunters who came in ever increasing numbers to harvest hides from Native lands. Often at their own peril. Appalachian ridges contain numerous such formations and have been used as shelters for centuries.